In Write’n’Slash you take control of a little doll called Molly who wants to write like humans, but the other toys hate this idea and are determined to stop her. You must now fight your way through increasing challenging waves of angry toys, but your only weapons are the words you type. You start Write’n’Slash with a selection of basic commands available which you execute by typing the word and pressing return. For instance, typing “slash” will make Molly perform a basic slash attack, typing “heal” will make her heal, typing “right” will make her move right, and so on. Some of your commands (such as blow or heal) are on a cooldown so you can’t constantly use them, however as you progress you’re able to loot new commands which give you more powerful abilities and attacks. You’ll need to know your way around a keyboard to survive for long, but Write’n’Slash’s fusion of hack ‘n slash gameplay and typing is a great premise that’s executed extremely well. 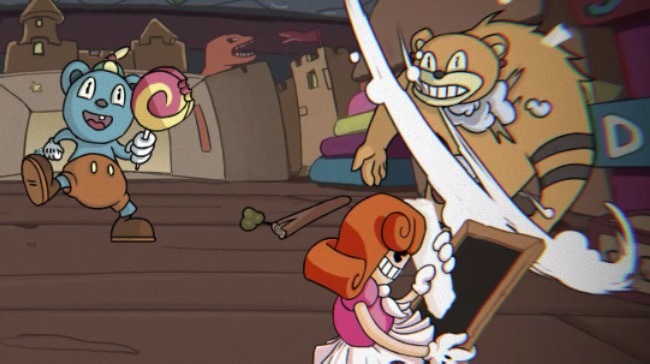 There’s a nice amount of strategy in deciding what commands to type and the Cuphead-esque hand drawn animation is fantastic (you may even see a familiar face in the background). Typing doesn’t get much more fun than this.